By 1985 with Sylvestor Stallone arguably at the peak of his Hollywood influence he generated this fourth and most audacious entry in the series. While immensely successful it was astonishingly scant of any storytelling bones. But such is the underrated filmmaking skills of Mr. Stallone to make an entertaining film essentially made up of two story beats, two dialogue scenes, two fights and glued together by montage scenes. 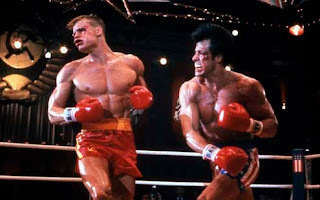 Rocky IV has so much wrong with it, it’s an easy film to pick apart, chew up and spit out. But it makes it so difficult to do that when the film is so damned fun. Why is that? First of all, the film is a huge cheat on the part of Stallone. There’s barely a film here, almost no story whatsoever. As usual, in the opening moments we see a flashback to the end of the previous Rocky film – Stallone coached by his former nemesis, Apollo Creed, fighting and defeating the snarling Clubber Lang (Mr. T).